1954 Les Paul TV model - Stevie began performing with this guitar around 1968. He continued to use this guitar throughout his time with Blackbird. 1952 Les Paul Gold Top - Stevie also performed with this guitar around 1968 with Blackbird. Unknown Black Strat - This guitar was used quite a bit by Stevie before he aquired Number 1. 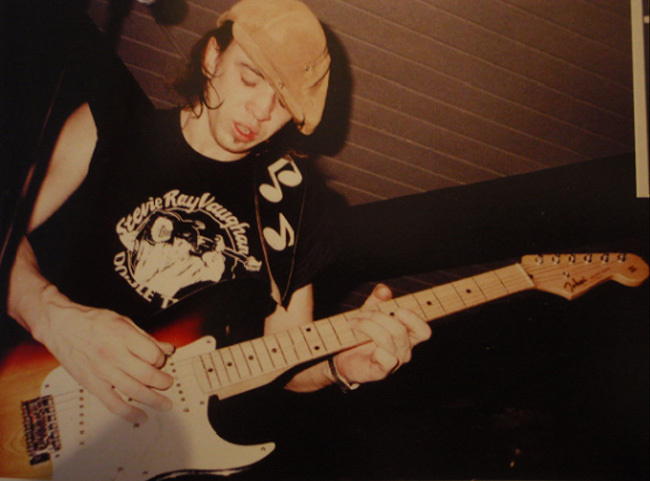 The guitar has "SRV" in small gold writing on the upper horn and a maple neck. 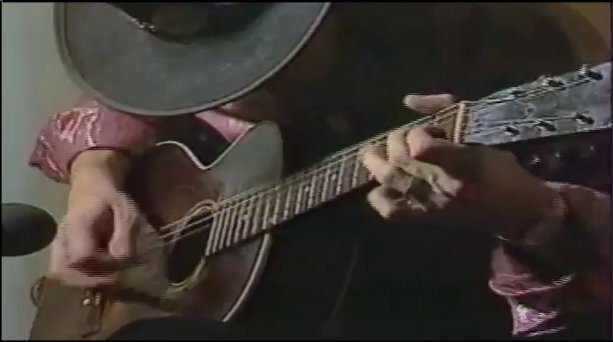 Lots of early footage of Stevie, most notably his performances at Antone's, show this guitar quite a bit. This is possibly the 1963 maple necked Strat that was traded for Number 1 in 1973. 1948 Airline 3 pickup model - rarely used. 1962/63 Fender Stratocaster "Number One"
This was Stevie’s main guitar. He got it from the owner of Ray Henning’s Heart of Texas music shop in 1973, and it quickly became his main companion. 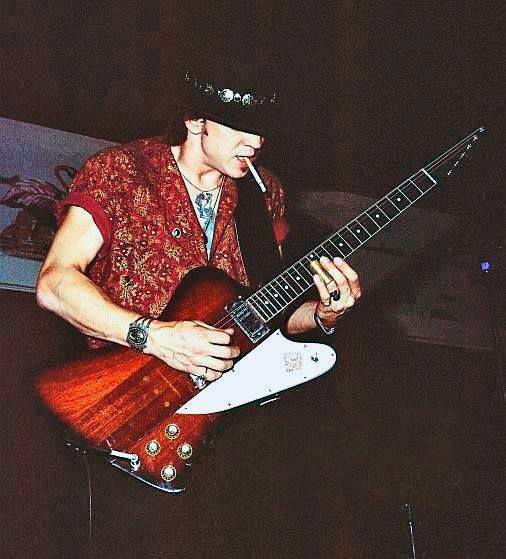 Number One originally had a white pickguard which was replaced with a black one that now adds the “SRV” logo, and a right-handed tremolo bar – now gold-plated left-handed. The guitar was built using a 1963 Stratocaster body and a 1962 neck, even though Stevie believed it was a 1959 Stratocaster. The reason for that was that he once took the pickups off and realized that they were made in 1959, so he made a conclusion from that. It was not until 1980 that Rene Martinez took the whole guitar apart and saw the year 1963 stamped in the body and 1962 on the neck. Stevie’s Number One is finished in sunburst and it’s original neck has a thick, D-shaped profile with 1-5/8″ (41mm) nut width. The fingerboard radius was originally 7.25″ but eventually came down to 10″. This was a consequence of countless refret jobs done by Rene Martinez, who mostly used Dunlop 6100 fretwire. The headstock was fitted Fender Schaller Elite Gold tuner pegs. The neck eventually became damaged beyond repair, so Rene figured out he’d put the neck from Stevie’s 1962 red Stratocaster on it. Unfortunately that neck was broken into pieces at a show in Holmdell, New Jersey, when a piece of stage equipment fell on several of Stevie’s guitars. After that, Number One had a new Fender neck until after Stevie died, when the original Number One neck was re-installed on it. Number One is currently in the possession of Jimmy Vaughan. This guitar first caught Stevie’s attention around 1979, when he went with couple of friends to a pawnshop in Austin, Texas. Unfortunately it cost $350, and he couldn’t afford it at that time. That didn’t stop his wife, Lenora, who talked to a couple of Stevie’s friends to cash in $50 each, so they could give it to him as a birthday present. The plan worked out, and they presented the guitar to Stevie on October 3rd 1980 at Steamboat Springs – nightclub he often played at. The guitar was originally a 3-tone sunburst maple-neck model with a rosewood fingerboard. It was refinished by the previous owner with a dark natural color, and it had arty inlay behind the bridge. Stevie decided to replace the neck with the mid-’50s-style maple neck given to him by Billy Gibbons. He kept the tremolo arm, pickups and frets in their original condition, but added his signature and initials on the neck plate and pickguard. This guitar also has Mickey Mantle’s autograph on the back of the body, who signed it on April 10, 1985, when Stevie was invited to play the national anthem at the Houston Astros season opener at the Houston Astrodome. Stevie recorded with this guitar on many of his heartfelt love songs, including “Riviera Paradise”, and of course – “Lenny”. The guitar was put up for auction at the Eric Clapton Crossroads Guitar Festival on June 24, 2004 and it was sold to Guitar Center for $623,500. This guitar was previously owned by Vince Martell, Vanilla Fudge’s lead guitarist, who sold it to Charley Wirz of Charley’s Guitar Shop in Dallas. The previous owner had hollowed out the body to mount four humbuckers but Wirz removed those and installed a new pickguard in which he placed a Fender single-coil pickup in the neck position. He also painted the whole body yellow, and installed Charvel brass tremolo system. 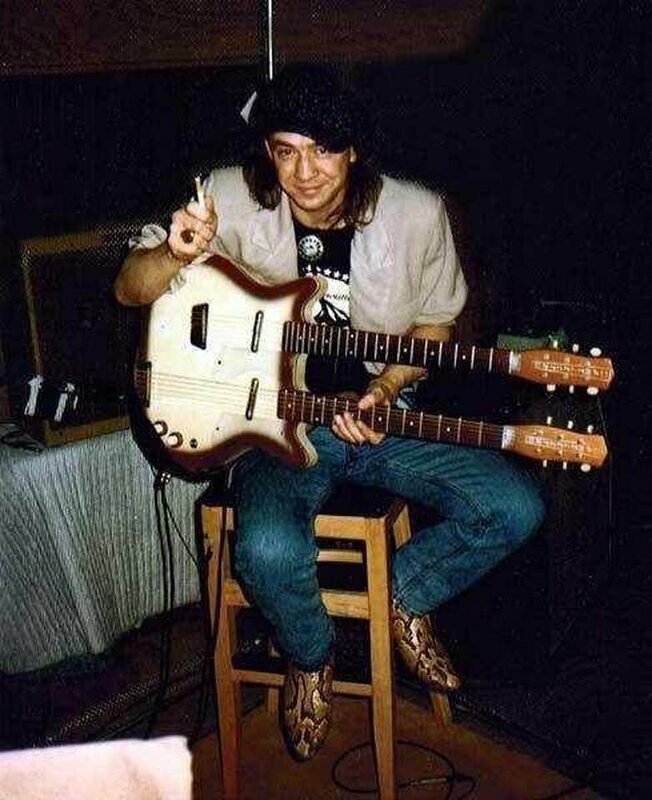 Charley then gave the guitar to Stevie in early 1981, who added SRV decals where the two pickups would normally be placed, just under the strings. This was supposedly the guitar Stevie played on the album versions of “Honey Bee” and “Tell Me”, and live on DVD “Live at Montreux” for the last song on the set – “Collins Shuffle”. Yellow was stolen in 1985 at the Albany International Airport in New York, but was later recovered and is now on display in the Las Vegas Hard Rock Cafe. In late 1983, Vaughan purchased a 1962 sunburst Fender Stratocaster from Charley's Guitar Shop, though he had it repainted by Fender in fiesta red as a custom color option, and simply named the guitar "Red." The guitar remained stock until 1986, when a left-handed neck was installed and "SRV" stickers were applied to the pickguard. In 1989, the neck on "Number One" was unable to withstand more re-fret jobs, replacing it with the original neck from "Red." The next year, following a concert at the Garden State Arts Center in Holmdel, New Jersey, a stanchion fell onto Vaughan's rack of guitars, splitting the neck from "Red" that was installed on "Number One." The neck was replaced in time for the next night's gig. was a custom Stratocaster-style guitar made for Stevie by James Hamilton in Buffalo, NY. It was presented to Vaughan by James as a gift from Billy Gibbons on April 29, 1984. This guitar features a 2-piece maple body and a 3-piece "neck-through body" design. It also originally had EMG preamped pickups, but Stevie didn't like the pickups in it. His next music video was about to be made, which was "Couldn't Stand the Weather" and he didn't want to get Number One wet during filming, so he used the Hamiltone for filming. During the recording of this video the pickups were damaged, and soon after replaced with vintage Fender single-coils. The EMG pickups and Gibson style amber top hat knobs were changed in June 1984. Scotch is a 1961 Fender Stratocaster used by Vaughan for the last 5 years of his life. He acquired this guitar in the fall of 1985, and it is said to have been bought in either Baltimore or "The Boathouse" in Norfolk, Virginia. It was to be a prize at one of Stevie's shows, but he bought the guitar instead and gave away another one of his guitars. This guitar has a butterscotch colored finish with a non-original tiger-striped pickguard made by Rene Martinez, Vaughan's guitar tech. The tiger-striped pickguard resembled the same pickguard Buddy Guy had on his butter-colored guitar at the time. "Scotch" was stock except for the tiger-striped pickguard where he added his famous "SRV" prismatic stickers. Stevie used this guitar when having problems with Number One, or regardless from that – live for songs such as “Leave My Girl Alone” and “Superstition”. This guitar was made by Charley Wirz – owner of Charley’s Guitar Shop in Dallas, in 1984. It has a white strat-style body with a rosewood neck, two controls (volume and tone) and Danelectro lipstick pickups. On the back of the body is a hula girl sticker and the neckplate has the words “To Stevie Ray Vaughan, more in ’84” engraved on it. Stevie played this guitar on “Life Without You” (which was Stevie’s tribute to Charley after his death in 1984), and live on the “Live at Montreaux” video. In 2003, Charley’s and Rene Martinez made 23 limited edition replicas of this guitar, selling for $2500. Stevie carried this guitar on tours between 1982 and 1985. It was given to him by Roddy Howard, owner of The Continental Club on South Congress in Austin until 1983, and later co-founded the Austin Rehearsal Complex in 1990. The guitar is from 1958, and had a green finish on the inside, and was supposedly one of 500 that had that interior finish. Stevie used this guitar to record “Stang’s Swang”. Stevie was seen playing this guitar around 1977/78, whilst in Triple Threat Revue and also while gigging with Hubert Sumlin, and it was supposedly one of his first guitars. 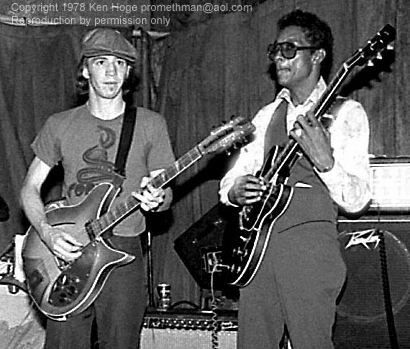 During one of the gigs – which happened to be on Stevie’s birthday, Hubert Sumlin showed up with no guitar after a cabbie drove of with his guitar and amp. Stevie decided to give the Rickenbacker and a Westberry amp to Hubert as a kind of reverse birthday present, though it was stolen soon thereafter. Amazingly, when Stevie found out the guitar had been stolen from Sumlin, he set out to find it and ended up recovering it. Once he got it back, he personally walked into Antone’s in Austin and returned it to Sumlin before his gig that same night. No one can say that Stevie wasn’t a good friend. Stevie used this guitar on MTV Unplugged. This guitar actually belonged to Stevie’s friend and personal assistant Timothy Duckworth. Timothy recalls that Stevie’s hands were so strong that he accidently cracked the neck. This guitar is now at The Hard Rock Cafe in Dallas. Little is known about this guitar, but Stevie stated in an interview with John Sebastian in 1990 that he used this guitar on “House is Rockin”. It was given to him by Jimmy around 1966 and is inscribed "Jimbo" on the back of the body. Stevie's 1928 National has been rumored to once being belonged to Blind Boy Fuller. It was given to him by his former roadie, Byron Barr who bought it from Charley’s in 1981. By most credible accounts, this was one of Stevie's prized posessions. He can be seen holding this guitar on the cover “In Step” album. 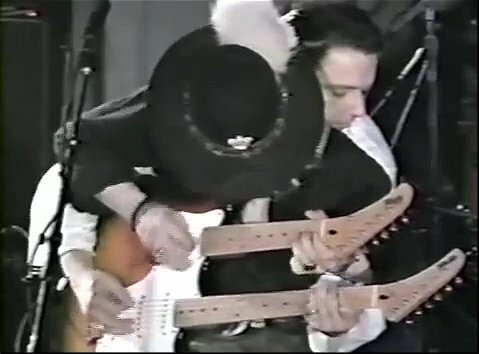 The only "known" recording of SRV using this guitar was on "Oreo Cookie Blues" on Lonnie Mack's "Strike Like Lightning" CD. Stevie was first spotted playing the red and white, semi hollow body 1963 Epiphone Riviera live on 14th January, 1971, in the band Pecos. He was later photographed playing this guitar in other early projects, like Blackbird, the Nightcrawlers (where he opened for ELO, KISS, and ZZ Top), and Krackerjack. Before Stevie realized his signature fondness for Strats, the Riviera was one of Stevie’s main instruments and remained in his collection long after he stopped playing it regularly. Over the years, it was photographed live in various states with and without the original pickguard. Famously, it popped back up on video over a decade after Stevie first played it in a fiery live version of “Hideaway” with two pickguards — one for the top and one for the bottom. Left: An early photo of Stevie and during a concert with BB King. This guitar was designed by Stevie himself. It is so bizarrely shaped and conceived that it defies most explanation. Stevie sketched out the shape and prototype design of the guitar in 1982 and consulted with experts on the technical limitations he'd have to overcome to bring it to life — mainly, arranging the pickup poles in the shape of his initials. It looks like a Telecaster spliced with a Stratocaster and then merged with a rounder take on a Gibson Moderne. Stevie was photographed with multiple takes on a single cutaway prototype body in 1984, as well as the double cutaway version in the mid-to-late-’80s. He was also captured playing a single-cut prototype live with an ill-fitting strat pickguard in 1988. Stevie’s Tokai vintage Strat copies are in many ways the oddest entry in this list. Stevie was rumored to play (and was photographed with) multiple Tokais in the ‘80s. Where this story starts to get interesting is the lack of available information on Stevie’s most famous Tokai: the sunburst, maple neck ‘50s-style Springy Sound model on the cover of Texas Flood. One of the most bizarre aspects of Stevie’s tie-in with the Springy Sound is that Stevie was never known by those close to him to have purchased it or have seriously played it live or in the studio. A popular guess is that Stevie bought the guitar while on tour, as he would often pick up guitars in the towns that he visited. Outside of the cover, few — if any — photographs of Stevie playing this guitar live (or in private) are known to exist. 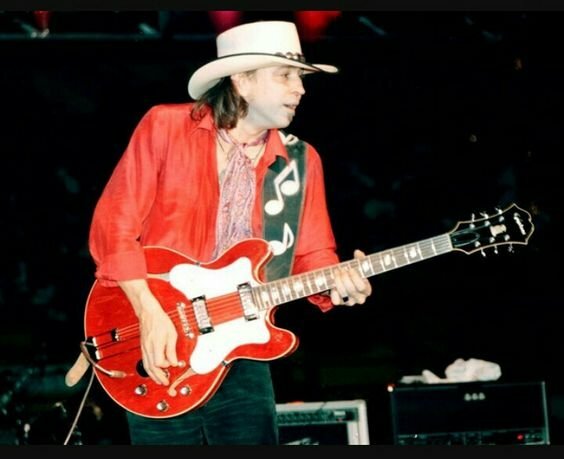 With that said, there is a "live" photo of the Texas Flood guitar in Hopkins' book from 1982, so it appears that he did use it live up until a year before Texas Flood was released. Craig Hopkins posits that an endorsement deal was being explored at the time, and five Tokai guitars plus a of couple basses were negotiated as a goodwill offering toward Stevie signing with the brand. A signed contract for a Tokai endorsement was found that corroborates Hopkins’ guess, but the signature and the information provided on the contract (dated 30th December, 1984) appears to be forged, with his wife Lenora — “Lenny” — as the signed witness. This potentially falsified contract was likely the basis for the creation of the ’85-’86 Tokai catalog and poster that featured Stevie Ray and Tommy Shannon playing Tokai guitars/basses. Stevie was known to have been infuriated by the marketing. 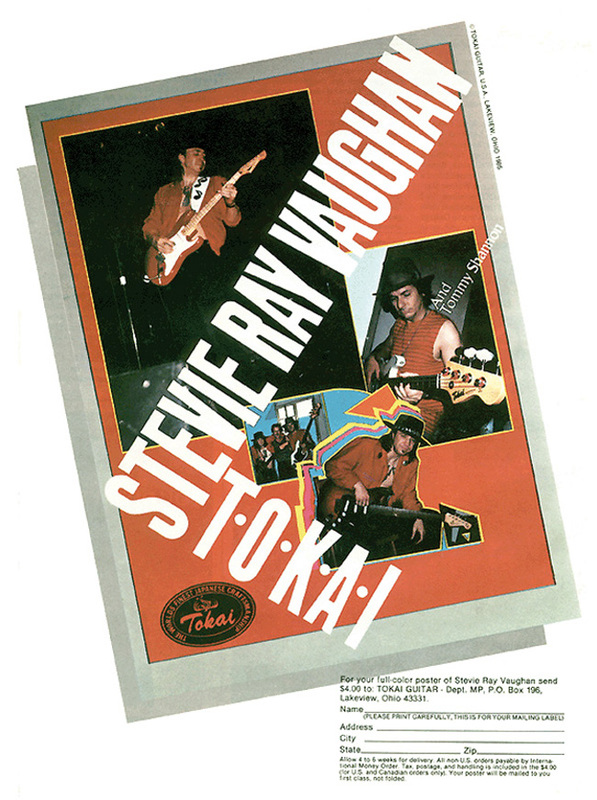 Once, when presented with the poster by a fan, Stevie wrote “I PLAY FENDER” over the Tokai logo. Another major complication to Hopkins’ explanation that the Texas Flood Tokai was a possible endorsement guitar is that the 1984-’85 timing of this deal puts Tokai in the middle of a headstock change for their American-distributed guitars. 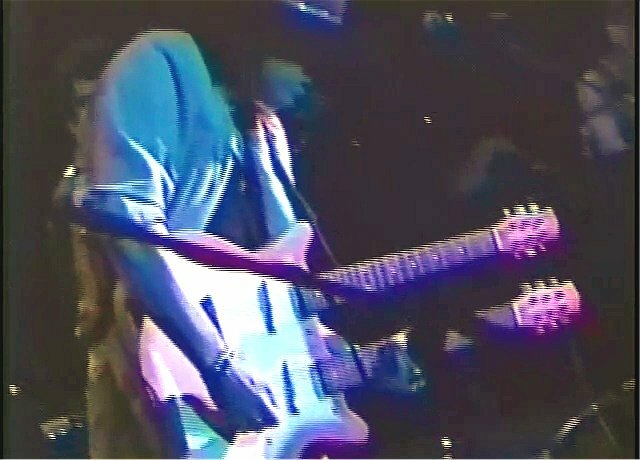 In fact, a Stevie-owned Tokai that sold at auction for over $20,000 (with COA and photographic proof) was, in fact, a Tokai AST, which featured an altered, non-vintage, Strat-style headstock. This guitar that sold also appears to be one of the guitars Stevie is photographed playing in the infamous Tokai poster. All of this together points to the free promotional guitars given to Stevie as being the 1984-introduced ASTs instead of his earlier Springy Sound models. To make this Stevie-Tokai situation even weirder, Craig Hopkins has stated that Stevie is also playing a Tokai on the cover of Live at Carnegie Hall. The photographic evidence from Chuck Pulin’s photoshoot that night lends credence to his claims, but the decal is neither conclusively a Tokai or Fender based on the available photographs. Stevie has also been photographed using Gibson Les Pauls. This one-off doubleneck guitar was used for the song "Pipeline" by Stevie Ray Vaughan and his brother Jimmie Vaughan, on board the riverboat SS Presidente, at the 1987 Jazz & Heritage Festival in New Orleans, LA. 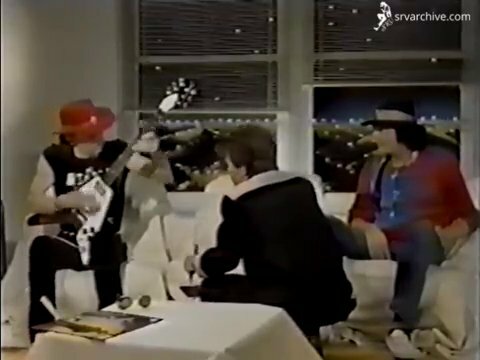 A short impromptu jam session with a Gibson Flying V, accompanied by Chris Layton drumming on the couch for MTV Japan from 1985. 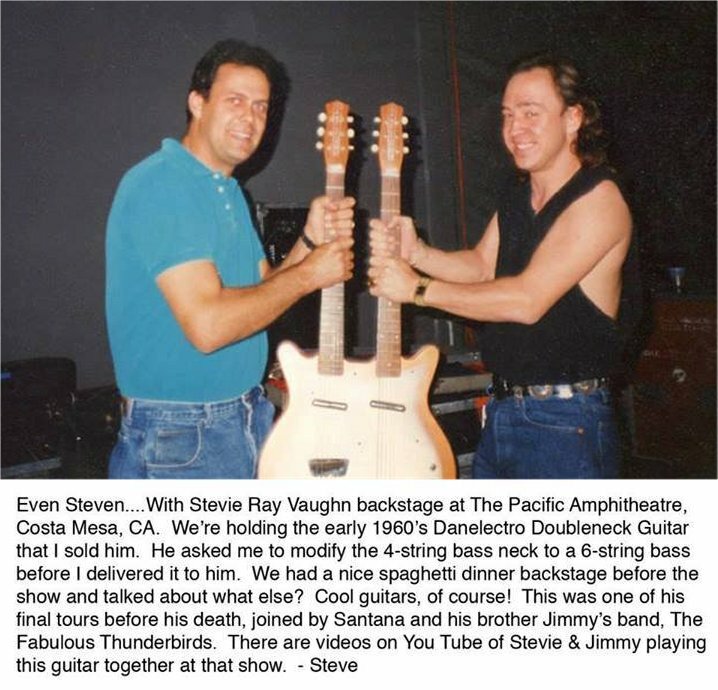 The 1960s Danelectro pictured above was used by Stevie on stage with Santana and brother Jimmie at the Pacifica Amphitheater, Costa Mesa, CA. The guitar originally had a 6 string neck and a 4 string bass neck, but Stevie asked for it to be modified to have a 6 string bass neck, instead of 4.
and finally, a rare photo of Stevie playing a customised Firebird!